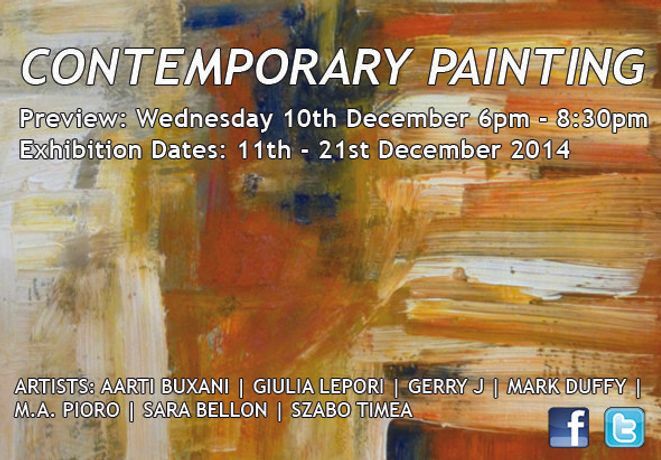 The Brick Lane Gallery is proud to present our last exhibition of 2014, CONTEMPORARY PAINTING. Featuring seven outstanding local and international artists who discover and reflect on the diverse range of possibilities that paint offers. Through this medium, they explore a wide range of themes, textures and sensorial experiences. From the colourful, contrasting and spiritual works by Aarti Buxani, the vivid and realistic still – life artworks by M.A Pioro, the abstract, dominating and alluring works by Sara Bellon and the dynamic, rhythmic and playful works by Gerry J the artworks show for themselves the different approaches and languages that can be discovered through paint, inviting us into a reality created by their brushstrokes. You are warmly invited to join the exhibiting artists for a drink at the opening night of CONTEMPORARY PAINTING at The Brick Lane Gallery from 6pm-8.30pm on Wednesday 10th December 2014. Aarti Buxani (from India) believes that painting is her life force and Art is her identity. Since the age of 12 she has dabbled in various art forms such as clay, wax and ceramic, however, her truest expression is found in canvas. She spent a decade in Kano, North Nigeria and the experience seeped into her bloodstream. The vibrancy of Africa, the sensuality and the strong images find their way out through Aarti’s work. She has held an exhibition in Abuja, at the Hilton hotel and painted extensively for friends and clients. She also obtained a diploma from the London Art College. Last year she returned to India, and her art took a new dimension. Whether it is a deity for a Toyota showroom or a statement wall in a residence, her fingers ache to create, mould and convey the essence of her being: ART. A recent trip to France impressed upon her the work of Cezannes and Michael Angelo, her future plans include working on some of their studies and sculptures. She finds inspiration in everything and all forms. Art is her soul connection. It's her life. Giulia Lepori (from Italy) lives in Montecatini Terme. She has recently graduated in painting in the Academy of Fine Arts of Florence with a thesis on food in painting. Her work is inspired by childhood memories and especially to the merger with what she is now. She wants to make paintings that immediately strike the viewer in the same way in which the images of her childhood books struck her when she saw them. In many of her works, the subject is food, which is an important part of her life. In recent years, she qualified as a pastry chef and worked in the kitchen, a source of great inspiration for her. Along with the food, in her work emerges the gay side that derives from it, that of guilt that occurs after eating greatly. Gerry J (from UK) spent a number of years working in London as a partner in a design and advertising company and he felt the need for change. With his family, he joined his brother in New Zealand where they designed, developed and built a family leisure park. After four years of managing the park, which had now become a public company, an offer was made for the purchase o their shares, which was accepted and this gave his family and himself the opportunity to travel around the South Pacific. Then, they returned to London, and shortly afterwards made a move to Spain where they spent ten years, firstly living on the coast, but the majority of the time living and working in Madrid. He is now settled in north Essex, but travel back to the Fiji Islands whenever possible where he started thinking seriously about his painting. He has always recorded his experiences either on paper, or on camera and these new canvases are the result of the years visiting the Islands. They reflect the constantly changing light and rich colours of the Fijian landscape and the surrounding sea. Mark Duffy(from Ireland) is a freelance artist with a B.A. from Maynooth University in English, Anthropology and Psychology. He came back to art during her college years and finds his chosen course has greatly influenced his work. While he loves all styles, he adores portraiture and finds the human face a magical subject full of emotion and depth. After selling pieces from The Green Gallery in Dublin, he received his first solo exhibit in October 2013 at the Icon Factory in Dublin. He is currently working on commissioned pieces, and developing a new collection. The four pieces here are a step outside her normal illustrative work. He wanted to expand from her portraits and create pieces to express and explore the inner depths of the mind. To venture into the story behind the eyes of our internal struggles and passions, not reflected in our speech or facial expressions, lighting the untold and unsaid stories we carry with us on our external journey. M.A.Pioro (from UK) represents from Italian landscapes, still-life and portraits, to collages and portable installations in boxes. Pioro's work encompasses an eclectic range of subjects and media. Surrealism and the Abstract have always been a strong theme in Pioro’swork, particularly in the artist's oil paintings. Her work is part of private collections in England, The Netherlands, Poland, Italy, France and USA. Sara Bellon (from UK) believes that the creative inspiration in her works is driven by the conception of these as living organisms: her paintings display a physicality and movement of their own achieved through an eclectic experimentation of mixed textures, layers and vanishing forms in an unlimited spatiality. Two oppositional forces operate in her paintings: the heavy brush strokes and thick textures are in place to conceal and reveal, at the same time, composite structures of colours and shapes. She applies a process of construction, de-construction and re-construction of structures and colours; these become surreal and contemplative compositions where dark reveal light, texture is balanced against colours through intricate elements and details that deserve close attention. Szabo Timea (from Romania) graduated from the Dr. Palló Imre Fine Arts High School in 2002 with oustanding results and got his university degree in 2006 at The West University of Timisoara. He has also studied fashion design at the the Faculty of Arts and Design. The topic of his examination was the Coca Cola. After he got permission to present his design, the company liked his ideas very much, so a month later an advertising campaign appeared and it was called “Noul Light Style Coca Cola”. The collection became Coca Cola Couture. Over the years he gained experience from famous artists, and during his studies he always took part in optional activities, events in order to develope my fine art skills. He has also won numerous prizes. After finishing his studies , he became the art teacher in the Elementary School, where he has also organised an optional art class. In 2012 Leslie Schönbrunn asked him to design and paint the cover of his besteller book called the Secret of Sába. In recent years he paints on commission and he has sold numerous paintings abroad. The central symbol of his works is the “SIN” present on different, almost theatrical locations, surrounding it with surreal creatures. His arts series, called “On the bank of the Léthé” has as a central motive, the apple, which has a symbolic value not only in the mithology, but also in the Bible. We are all attracted to something that is forbidden, to the sin, to the comfort and to the excitement. He likes to combine the realistic with the surreal, manipulate the layers until he finds the lifelike. He is endlessly defining and redefining the craft of oil painting to fabricate an animated, breathing image grounded in the recognizable and familiar. He is enchanted by the dramatic contrast of the black and red, how they highlight each other’s elegance, by the possibility of the endless game of the light and shadow. His paintings combine the profane with the heavenly, the classical style with the mysticism, the realism with surrealism.